Buxus Sempervirens is an all-time favourite – it has been used widely for topiary since Egyptian times and is still popular today. Whilst it has been a victim of fashions coming and going, it is very versatile and can be used for hedging, trees, containers and window boxes. It is largely used as a clipped bush (the art known as topiary) but latterly has been used untrimmed, commonly known as ‘wild Buxus’. Common shapes that it can be supplied in are spheres, pyramids, cones and cubes to name a few; then there are the ornate and intricate shapes that can be formed over many years such as animals people and, well…. pretty much anything! Most stately homes in Britain have some area of formal garden that would include topiary. 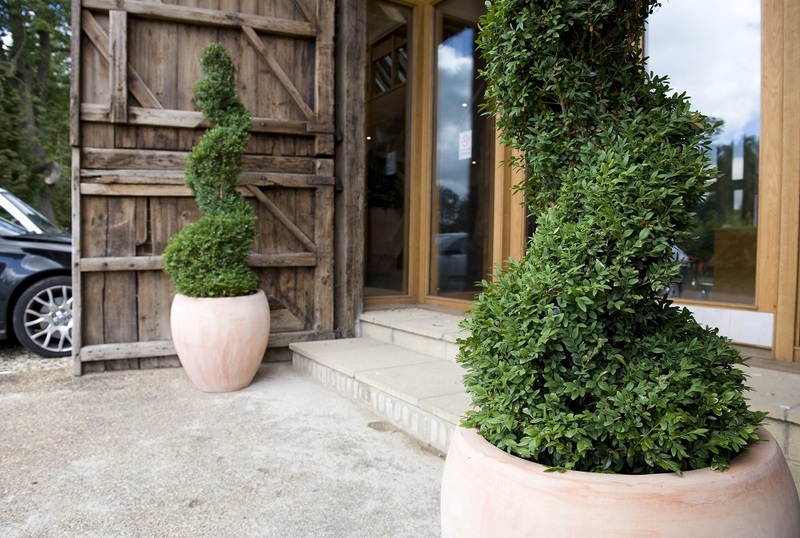 The geometric shapes of Buxus can look particularly stunning when planted in a large decorative planter – an example of how an ancient species can have modern contemporary appeal. When used in a landscaped bed, these shapes are inevitably a focal point. Buxus hedging was particularly popular in the 17th century, again used in the gardens of many stately homes, often taking the form of a maze! Low level hedging, interspersed with formal shapes, was a trademark of the Capability Brown designs used up and down Great Britain. In the 21st Century it has been one of the most popular species for city planting being used to frame the entrances of many landmark buildings and being used to decorate many roof terraces. Buxus requires regular trimming if it is to be kept in a formal shape. It requires little attention otherwise once it is established. In planters it require regular watering during the summer months and care is needed that it doesn’t get waterlogged during winter. It is prone to Buxus blight, which once established, is impossible to eradicate. Prevention is carried out by sourcing good stock from a reputable supplier and keeping an eye on watering requirements on a regular basis.